Six questions for Danielle Pizzutillo, the beverage director at Embeya, the Asian restaurant in the West Loop. 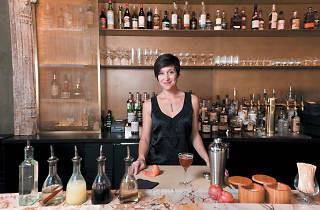 Photograph: Max Herman Danielle Pizzutillo is the beverage director at Embeya, Thai Dang's Asian restaurant in the West Loop. When we think about it, the connection between architecture and cocktails isn't too far off. When we taste cocktails, we often describe their structure and balance. Bartenders even "build" their cocktails, adding each component to the mixing glass or shaker tin. And craft cocktails are very visual—the color, garnish and texture of a drink can be just as important as its taste. 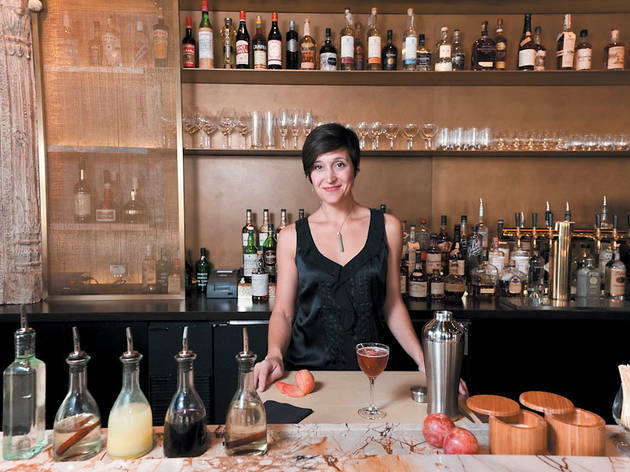 So it shouldn't be a surprise that Embeya beverage director Danielle Pizzutillo worked for 10 years as an architect. She traded in her AutoCAD software for a corkscrew when she started working at the opulent but regrettably shuttered Ria inside the Elysian Hotel (now the Waldorf Astoria). At Elysian, she worked with an incredible spirit collection and became fascinated with the stories behind each bottle. She made a point to learn every bottle on the back bar because she didn't want to disappoint her team or the clients. "When you have desire to learn, the knowledge you seek can be absorbed quickly," Pizzutillo explains. "I still continue to push my professional boundaries and strive to become better and better in craft and service." We asked Pizzutillo six questions to better understand her approach to cocktail making. What is your approach to making cocktails? I create cocktails that pair with food. I like to incorporate a nod to American classic-style cocktails and pull from some of the amazing ingredients found in Southeast Asian countries. What were your goals when you started Embeya's program? I wanted to create a sophisticated program with a curated portfolio filled with premium sakes, beer and select grain-driven spirits. I also wanted to make beautiful cocktails that complement the food and would be enjoyed through the whole meal. What is your cocktail-making style in three words? Many inspire me: Benjamin Schiller for his spirit selection; Adam Seger for his entrepreneurship; Paul McGee for having the sickest set-up in the city. I have to say, though, that I have been trained and mentored by so many of the fine cooks I've gotten to work with, not necessarily bartenders. A good cook keeps a clean station, preps their station with pride and intent—these are all the things that matter to me. Kitchen technique, flavors, proper treatment and the process of [selecting] ingredients are the things that have helped guide my style and palate. What is the most important skill a bartender should have?